We know, fall has just begun. So why start talking about snow and snow removal and all those frigid things — can’t we just enjoy the nice comfortable temperatures before we have to start dealing with snow? Well, we could, but we want you to be prepared. As your local snow removal business, we don’t want you to wait until the first big snow to start worrying about snow removal and management. When looking for a snow removal company, keep these tips in mind and look for these four qualities. If you are in our service area — Akron, Barberton, Medina, Wadsworth, Cuyahoga Falls, and other surrounding areas — and would like to schedule your routine snow removal for this summer, contact us today to secure your spot. Do you have special requests? Is there a certain time you need your lot plowed? Is there a time when plowing shouldn’t be done? When you reach out to your prospective contractor, are they available or do they return your call? It is crucial that you express your concerns and needs with your prospective contractor and that you have an established line of communication. As is the case with many services, there are many ways to accomplish a task. This is certainly true in our line of work — landscaping and snow removal. When we are managing the snow on a commercial or residential property, we strive to find the most efficient, yet effective way to perform a task. This is a quality you should look for in your prospective snow removal company. Ask about their process, equipment, and how they strive for efficiency. Timely snow removal is crucial to both residential and commercial customers. Your prospective contractor should make this abundantly apparent. Since many snow storms happen overnight and cause trouble in the morning, it is important that your snow management company is able to clear your property quickly and when they say they will — ideally, in the early morning. As a business owner, it is crucial to start your day with a clean and clear lot and sidewalks. This will keep snow from negatively affecting your business. Attention to detail is a virtue in the world of snow removal and landscaping. This is the quality that sets apart the best from the mediocre. It’s the mark of the professional. When removing snow, showing attention to detail doesn’t just give you the feeling that everything looks nice, but it also logistically makes the most sense. For example, an experienced snow removal contractor will identify the best place to push the snow, the place that won’t damage property, keep driving lanes clear, and prevent ice from building up on your property. Before winter sets in and snowstorms start rolling through Ohio, call your local snow removal company and schedule your routine snow management. 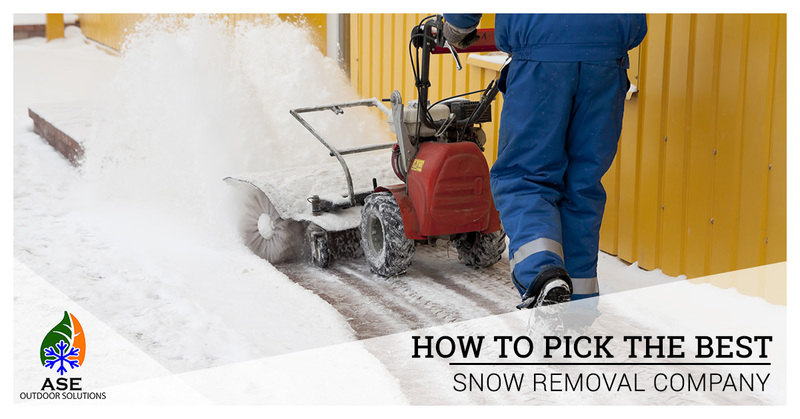 When looking for the right snow removal company for you, be sure to keep these tips in mind. Learn more about us, our service area, our services, and contact us today to get started. Call Now Or Book Online Below!